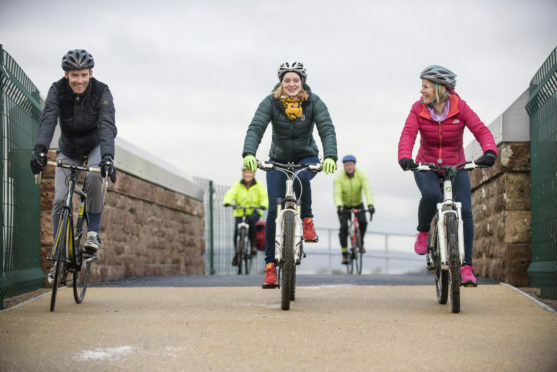 Cyclists cross the existing link on the Drumrosach Bridge which opened in 2016 linking the Inverness Campus and Inverness Retail Park. Wills Bros Civil Engineering Ltd has won the £1.96million project, with construction expected to begin by the end of this year. Full completion is set for the summer of 2019. Ruaraidh MacNeil, HIE’s project director for Inverness Campus, said: “This is about improving access to and from Inverness Campus by extending the low-carbon travel options that have formed part of the development from the outset. The overall cost of the project is £2.7million, with the additional £856,000 coming from the Scottish Government through the Sustans Scotland’s Community Links programme. Around 2000 pedestrians and cyclists a week use the existing Drumrosach Bridge linking Inverness Campus with the retail park. The Inverness Campus was opened by Deputy First Minister John Swinney in 2015 with the latest contract award cementing itself as another milestone for the development of the facility.